Haryana Civil Services Admit Card 2019 is available now to download. The Haryana Public Service Commission (HPSC) officials going to conduct the HCS (Ex. Br.) & other Allied Services- 2017 Preliminary Examination on 31st March 2019 (Sunday) at various Cities of Haryana along with Chandigarh in Two sessions (Morning 10:00 AM to 12:00 Noon & Evening 03:00 PM to 05:00 PM). For this, The HPSC HCS (Ex. Br.) & Allied Services Admit Card along with instructions to the Candidates for the HCS (Ex’ Br.) & other Allied Services Preliminary Examination are available on Commission’s website from 16th March 2019 and the candidates can download the same from the Commission’s website i.e. hpsc.gov.in. Admit cards are not being sent separately to individual candidates. Applicants need to download the HPSC HCS Admit Card 2019 by keying the application number, date of birth. The Haryana PSC HCS (Ex. Br) Admit Card 2019 is a main document for the written examination. So all the competitors must carry the Haryana Civil Services Admit Card 2019 for the test center. Here on this page, we had provided all important information about the Haryana Civil Services Admit Card 2019 like the importance of the admit card, information on hall ticket, essential documents for the examination, crucial documents need to carry for the examination, examination date, and steps to download the call letter. So all the competitors can go through this whole article and capture all useful information about the HPSC HCS Admit Card 2019. The Haryana Civil Services Admit Card 2019 will be available through online mode at www.hpsc.gov.in. Applicants need to download the Haryana HCS Allied Services Admit Card 2019 before the examination to avoid last minute rush. Candidates come to know about the examination center, exam date, time duration information by seeing the Haryana Civil Services Admit Card 2019. The Haryana Civil Services Admit Card 2019 act as an entry pass. Without Haryana PSC HCS (Ex. Br) & Allied Services Admit Card 2019, it is not possible to write the examination. 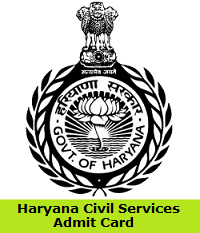 The Haryana Public Service Commission (HPSC) officials activated the Haryana Civil Services Admit Card 2019 link at the official website. We suggest all the competitors must carry out the HCS Allied Services Call Letter 2019 for the examination. 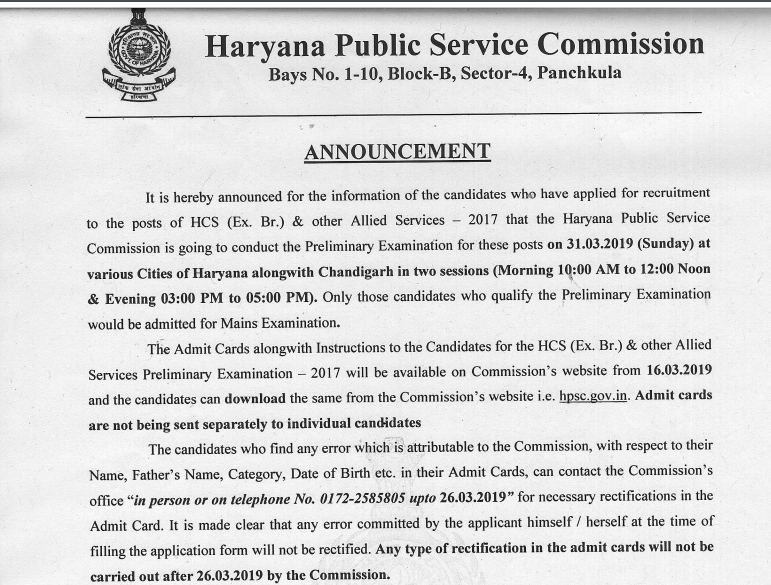 The Haryana Public Service Commission (HPSC) officials need to use the below provided information to download the Haryana Civil Services Admit Card 2019 from the official website. The Haryana Civil Services Admit Card 2019 contains information about the examination and applicant related information. Candidates need to carry any one of the ID Proof issued by the government to the examination along with Haryana Civil Services Admit Card 2019. Applicants login to the official website of HPSC at www.hpsc.gov.in. Haryana Public Service Commission (HPSC) homepage will open. Find the Haryana Civil Services Admit Card 2019 link in the announcement section. Enter Registration ID, Password details and submit them. As per given data Haryana Civil Services Admit Card 2019 will display on the screen. Check the available data on the call letter and download it. Finally, take 1 or more copies of admit card to carry for the examination. The above provided information about Haryana Civil Services Admit Card 2019 is handy for the candidates who had applied for HCS (Ex. Br.) & other Allied Services vacancy posts in the HPSC organization. For more information keep following Sarkari Recruitment on a daily basis.